The 2016 Cats' Pause Kentucky Football Yearbook previews the upcoming season with 144 color pages of features, commentary and photographs. 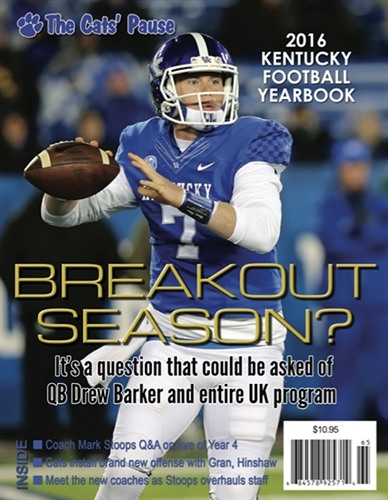 Includes exclusive one-on-one Q&A with coach Mark Stoops, a look at UK's new assistant coaches and a new offensive scheme and we show you how to build the perfect quarterback. Also, a district-by-district preview of high school football in the Commonwealth. On sale now. Cover price $10.95 plus $4 postage.